An Iowa native who died in combat in Iraq April 25th will be buried today. Twenty-eight-year-old Sergeant LeRoy Webster was on active duty with the U.S. Army when he died, but he had been a member of the Iowa National Guard. Guard spokesman, Lieutenant Colonel Greg Hapgood, says Webster was busy while in the Iowa Guard from 2001 until 2006. Hapgood says Webster had deployed twice with the National Guard, once for Operation Noble Eagle in 2002 providing security in Newport, Indiana. He also later deployed to Afghanistan with the First Battalion, 168th Infantry for a little over one year. "So he really was an integral part of several different units of the Iowa National Guard with the time that we had with him," Hapgood says. 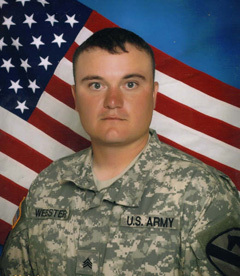 Hapgood says Webster transferred to the active duty Army in 2006. Hapgood says they have a couple of soldiers in the course of a year that transfer to active duty, especially after they have been on a deployment like Webster and find they like the full-time service. Hapgood says Iowa soldiers will be prominent in honoring Webster’s memory. Hapgood says the Iowa National Guard will provide the honor detail and the family has asked guard members to play specific roles in the funeral. He says some of Webster’s closest friends were members of the Iowa National Guard. Hapgood says Webster’s death is another stark reminder that many members of the military are still in dangerous situations. Hapgood says with all the military men and women in harm’s way, the Iowa Guard was "extraordinarily fortunate" to go through last year without the death of a guardmember. He says their prayers are with Webster’s family and all the Gold Star families in the state every day. Webster was born in Spencer and graduated from Hartley-Melvin-Sanborn High School in Hartley. His funeral is 10 A.M. Saturday at Hartley-Melvin-Sanborn High School. Webster is survived by his wife, Jessica, daughters Natasha, Kaydence, and Jadyn, and his father and mother, Donald and Crystal Webster, all of Hartley. A trust fund has been established for the Webster children. All donations may be sent to: Webster Children Trust Fund, Savings Bank of Hartley, 80 South Central Ave, Hartley Iowa 51346.